Fibertech door collection was developed to deliver the luxury look of wood doors but save considerable efforts on maintenance of such doors. These heavy, well insulated fiberglass doors can have elaborately embossed panels or thick custom designed glass inserts to accent their look. They are also available in a variety of rich textures such as oak, cherry, mahogany, fir, teak and even knotty alder. 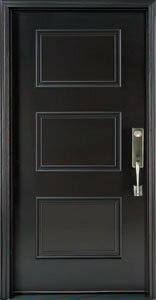 Premium quality Fibertech entry doors offer excellent performance as well as fell and appearance of an authentic wood product.